The first time I met a real writer – a poet – I wanted to be just like him. Not because I liked poetry, Alligator Pie excluded, of course, but because he got to eat Hostess potato chips—a large bag, all to himself, salt-and-vinegar flavor. 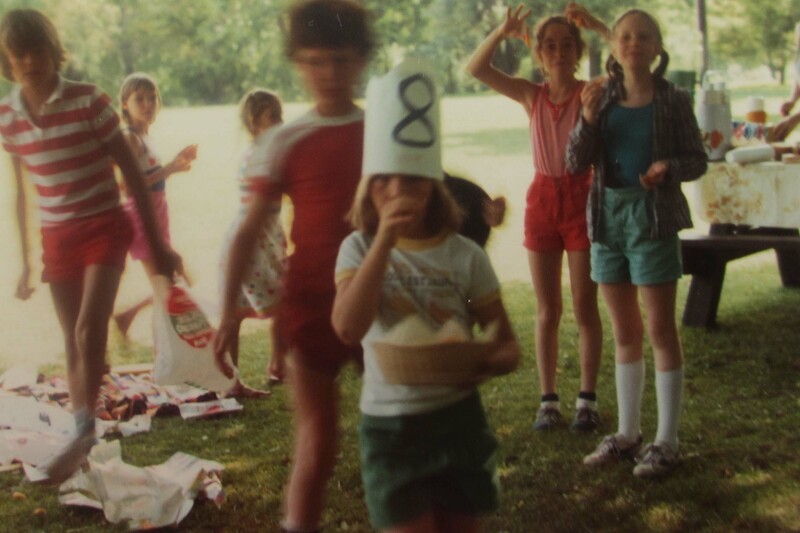 I grew up in London , Ontario in the 1970s and 80s. My parents were artists: they had a pottery business in our backyard studio and also my father was a painter. We were part of a vibrant arts scene, which boasted such luminaries as Greg Curnoe, Jack Chambers, Jamelie Hassan, Bernice Vincent, and, a little more peripherally, Patterson Ewing. I was keenly aware of how different my parents were from those of my school friends, whose moms and dads put on uniforms and went to work outside the home—at factories, hospitals, the post office—whereas my parents put on their clay-spattered clogs and denim aprons and walked across the back garden to the studio where they switched on CBC radio and produced the functional pottery from which we made our living. But the detail that really divided my family from my schoolyard friends was the food we ate. I realize now how lucky I was to have been raised on the abundant vegetables my parents grew in our garden, as well as the bread my mother baked, her jams and pickles and sauces, sausages we prepared ourselves from meat called “organic,” even way back then. I rejected this healthy, wholesome food, coveting instead what came inside all those brightly colored boxes and cans on grocery store shelves and which was firmly, resolutely banned from our home and my diet. This was the food of the kids at school: Chef-Boyardee, Kraft cheese slices, cookies that did not have dates or wheat germ, any kind of chips and dip. And so I cultivated friendships with kids my own age not so much to play with them, but to get invited over for lunch, savoring sweet Heinz ketchup, soft white bread, a rainbow of Kool-Aid flavors chilling in the fridge. The artists my parents hung out with ate like we did; and we all ate a lot, as food was the nucleus of our frequent get-togethers: pig roast nights and Nihilst Spasm picnics, multi-family dinners of wild game and fiddleheads held in the converted warehouses or lumberyards where our crowd tended to live. I enjoyed this food, always homemade, the ingredients boasting unusual pedigrees, the recipes often from a culture not our own, but I would have traded succulent lamb cooked in a pit of clay for a bowl of Kraft Dinner any day. And nor was I very interested in drawing or painting or making pottery. Rather, I went in for books: nothing too difficult or profound, Judy Blume and Gordon Korman being my favorite authors. It was a Saturday afternoon when I decided to become a poet. I was with my dad at a friend’s place, an artist of growing repute whose son was close to my age. A man I did not recognize sat leaning way back into a low corduroy couch surrounded by round leather cushions from North Africa. I ended up sitting beside him; likely I was drawn to the large bag of chips he was eating. How was he allowed to break the rules like this? His shirt was badly mis-buttoned, exposing much of his thin, naked chest, and his thick glasses kept slipping down his nose, sweaty from the vinegar in the chips (and I think his lips were going a bit blue). Chip crumbs fell from his mouth all down his front, a few getting caught in his chest hair. He said his name was Phil. Soon I was telling him all about how my grade three teacher changed her outfits in the cloakroom when she thought no one was looking. “Really?” Phil opened his eyes wide, eager for the details. On the car ride home, my dad said he hadn’t noticed that Phil was eating salt-and-vinegar chips. “But they sound awful.” Phil was a poet, my dad explained, so he was allowed to eat things like that. I told my dad I wanted to be a poet like Phil. And so my dad, always encouraging my interests (unless it was in Fruit Loops or creamiest Skippy peanut butter) brought me library books by Phil and other Canadian poets, including Leonard Cohen, Michael Ondaatje, and Margaret Atwood too. I read the very short poems, and any that didn’t have capital letters. Then I put them aside, picking up Who is Bugs Potter?, my favorite Gordon Korman novel. The pleasure of poetry was all in the potato chips, I decided, especially if they were Hostess. Nadia Bozak is the critically acclaimed author of the novels Thirteen Shells, El Niño and Orphan Love. She is also the author of The Cinematic Footprint: Lights, Cameras, Natural Resources, a work of film theory. She is Assistant Professor of English at Carlton University in Ottawa.